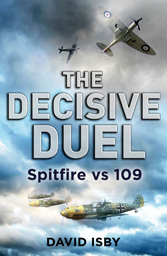 The first episode of the new Channel 5 TV series starts with Douglas Bader who is a major character in THE DECISIVE DUEL, although it seems to focus on his flying Hurricanes while leading 242 Squadron during the Battle of Britain. I include in THE DECISIVE DUEL “Stan” Turner’s reponse to Bader’s speech on taking command: “That’s horseshit, sir”. Bader, as a Cranwell man, noted that he did say sir and listened to what he had to say. One thing the television may not tell you is that many of 242’s ground staff ended up dying on the Burma Railway.